This product was manufactured in the United States under the strictest quality control standards with a purity level exceeding 99%, assayed via HLPC. It is furnished strictly for non-diagnostic, non-therapeutic in-vitro applications only. It is not intended for direct human and/or animal consumption and should only be handled by qualified professionals. 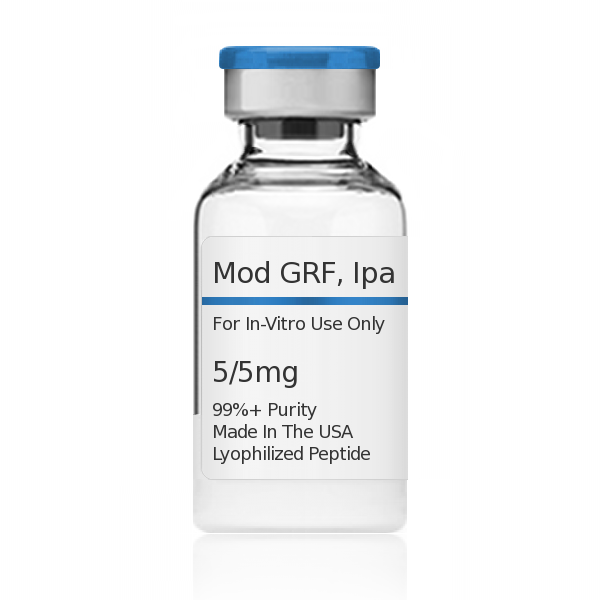 GHPeptides™ Modified GRF 1-29, Ipamorelin Blend has a peptide purity level that exceeds 99.0% as determined by HPLC. This peptide was synthesized with no additives and is supplied as a white lyophilized (freeze-dried) powder. It is recommended to reconstitute the lyophilized Modified GRF 1-29, Ipamorelin Blend in sterile water, which can then be further diluted in other aqueous solutions. Lyophilized Modified GRF 1-29, Ipamorelin Blend although stable at room temperature for 3-4 weeks, should be stored desiccated below -18°C. Upon reconstitution, Modified GRF 1-29, Ipamorelin Blend should be stored at 4°C out of direct light for between 10-14 days and for future use below -18°C. Prevent repeated freeze-thaw cycles. This product has been synthesized for in-vitro laboratory studies to be performed with cells or biological molecules. This product is not a drug and has not been approved by the FDA to prevent or cure any medical condition or disease. The purchaser is solely liable for risk involved with using this product for any purpose outside of in vitro studies.